Source: JobsEQ, Chmura Economics and Analytics, Nov 2017, seasonally adjusted. U.S. Department of Bureau of Labor Statistics. The unemployment rate displays the percentage of the labor force that is unemployed by place of residence. The labor force is made up of those 16 years or older who are either employed or unemployed but actively seeking employment. Discouraged workers who are not looking for employment are not included in the labor force. High unemployment in a region reflects labor market weaknesses. 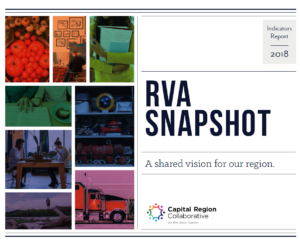 In the Richmond Region, the unemployment rate has decreased from 5.1% to 3.9% since 2015.